The contests only take two minutes to set up. It’s just a matter of logging in to MobyMax, clicking the “Contests” button, and entering contest information. Teachers can create a summer learning handout to email to parents or include in final report cards. These handy sheets already include the student’s username, password, and contest goals. 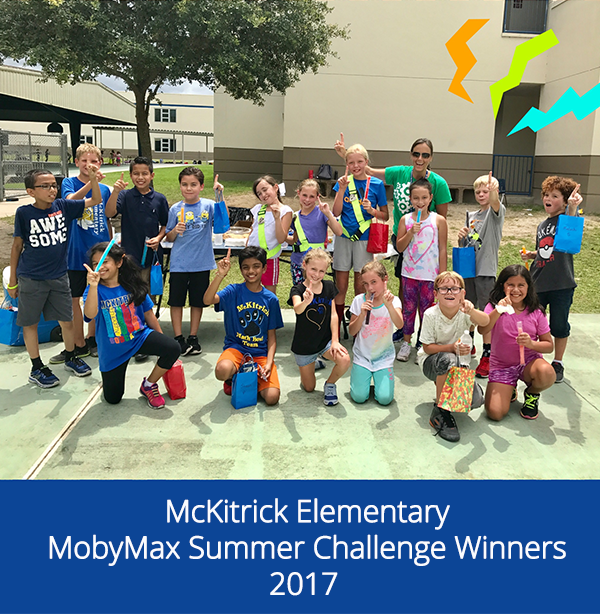 At McKitrick Elementary in Florida, teacher Monica Contreras organized a “Summer Olympics” with free, optional participation for students throughout the summer. The goal was to earn 1,500 points by the end of the eight-and-a-half week summer break. Those who did so were invited to a special movie and treated to popcorn and snow cones. Students who earned more than 2,000 points earned the chance to win additional gift cards and treats. (Read more about this story here). McKitrick already has plans underway to run another contest this summer. This time, they’ll be rewarding students who rack up at least 10 focused hours in any subject with prizes ranging from snow cone parties to spirit ribbons to $25 gift cards. Take a look at the flyer they sent home to parents below. With summer break almost here, we asked teachers in our MobyMax Facebook community to let us in on their contest plans for 2018. You can read their inspiring and creative ideas here. 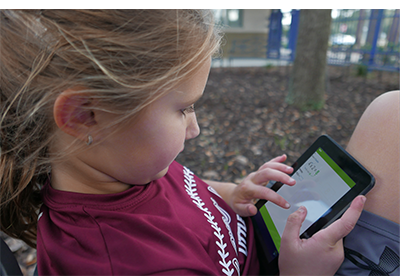 We also heard from a 4th grade teacher in Blount County, Alabama who will be using MobyMax Fact Fluency during her June summer camp. She’s looking for additional reward ideas, so if you have an awesome student reward idea, please share it on Facebook here. 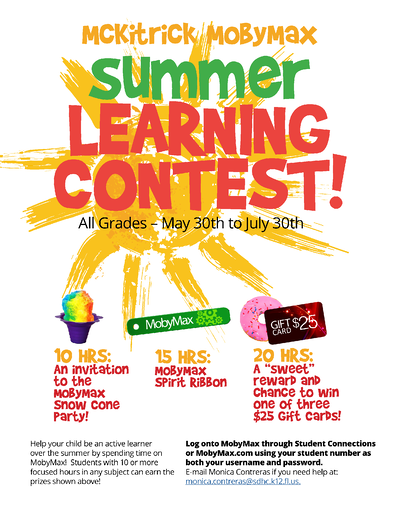 * MobyMax Summer Olympics: Any student with at least 10 hours in Moby Math, Language, or Science earns a ticket to a special back-to-school field day. * Moby Fact Fluency Contest! Any K-2nd grader mastering addition or subtraction and any 3rd-5th graders mastering all 4 operations attends a fall ice-cream party and is entered into a raffle for a Dairy Queen gift certificate. * Math and Language summer challenge! Students that earn at least 1,000 points in Moby Math or Language over the summer get to attend a special field trip in the fall.